The mechanism of breathing (1) introduces air into the lungs for the exchange of oxygen and carbon dioxide. 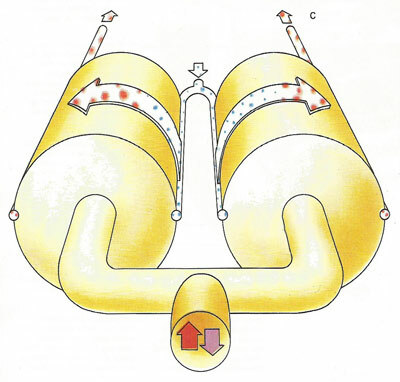 Air is funneled into the trachea (1), the flexible windpipe ringed with cartilage. Up to 25 cm (10 in.) long, the trachea forks into the left and right bronchi (2), which enter their respective lungs. 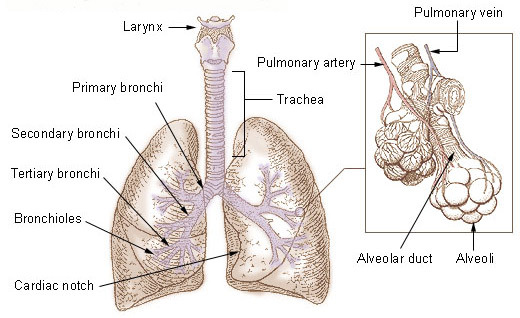 Each bronchus branches into several small segments or bronchi (3), terminating ultimately in more than 250,000 respiratory bronchioles (4), each about 0.5 mm (0.02 in.) in diameter. Beyond lie the alveolar ducts leading into hollow alveoli (5). Here in the alveoli, networked with capillaries (6) only one cell in width, diffusion occurs across a fine membrane. Stale blood is reoxygenated and makes its way back to the heart (7) to be pumped to each living ell in the body. Carbon dioxide is eliminated from the lungs in expired air. Breathing (lower left, 2A) involves expansion of the rib-cage and lowering of the domed muscular diaphragm. As the lungs expand air enters the respiratory tract. The muscles of the diaphragm relax as we breathe out (2B), and the chest subsides. The transfer of oxygen in inhaled air into the blood and of waste carbon dioxide from the blood into the lungs occurs in the alveoli. Ventilation (A) is a vital part of the respiration cycle. It involves: (1) exhaling stale air; (2) breathing in fresh air rich in oxygen; (3) the exchange of oxygen carbon dioxide; (4) the elimination of carbon dioxide. 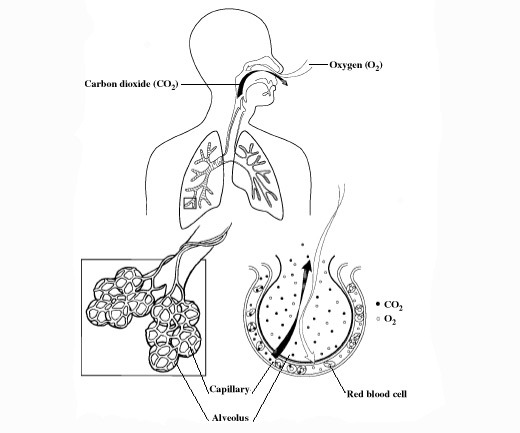 A diagrammatic view of the alveolar surface (B), shows the rapid transaction of oxygen for carbon dioxide. Fresh blood is returned to the main circulation to fuel the body cells. Carbon dioxide is expelled, along with water vapor collected in the moist respiratory passages when we breathe out. For respiration to take place, chemicals and oxygen must react together; carbon dioxide and water, the end products of this reaction, must be removed (C). The pulmonary artery conducts stale blood, dark with reduced hemoglobin, out of the heart. Reoxygenated in the lungs, and now bright red in color, it returns to the heart by way of the pulmonary vein to be pumped afresh around the entire body. The lungs are spongy, sac-like respiratory organs in the chest cavity which, together with the heart, work to remove carbon dioxide from the blood and provide it with oxygen. As the body surface is too small to absorb all the oxygen necessary to fuel millions of cells, humans and other complex animals have developed a special internal surface for breathing. This is the lining of the lungs, a vast expanse of up to 70 square meters (753 square feet) in the adult – over 40 times the surface area of the body. The additional value of this internal surface is that it remains permanently moist and is protected to a great extent from damage and the intrusion of bacteria, fungi, and other threatening organisms. Thin as tissue paper and interlaced with a network of fine-walled capillaries, the internal lining of the lung absorbs oxygen for rapid transfer to the hemoglobin of the blood. At the same time carbon dioxide, a waste product of cell metabolism, is released from the blood. The trachea (windpipe) branches into two smaller airways: the left and right bronchi, which lead to the two lungs. The left lung is longer, narrower, and has a smaller volume than the right lung it shares space in the left side of the chest with the heart. The right lung is divided into three lobes and each lobe is supplied by one of the secondary bronchi. It has an indentation, called the cardiac notch, on its medial surface for the apex of the heart. The left lung has two lobes. The bronchi themselves divide many times before branching into smaller airways called bronchioles. These are the narrowest airways – as small as one half of a millimeter across. The larger airways resemble an upside-down tree, which is why this part of the respiratory system is often called the bronchial tree. The airways are held open by flexible, fibrous connective tissue called cartilage. Circular airway muscles can dilate or constrict the airways, thus changing the size of the airway. At the end of each bronchiole are thousands of small air sacs called alveoli. Together, the millions of alveoli of the lungs form a surface of more than 100 square meters. Within the alveolar walls is a dense network of tiny blood vessels called capillaries. The extremely thin barrier between air and capillaries allows oxygen to move from the alveoli into the blood and allows carbon dioxide to move from the blood in the capillaries into the alveoli. Each lung is enclosed by a double-layered serous membrane, called the pleura. The visceral pleura is firmly attached to the surface of the lung. At the hilum, the visceral pleura is continuous with the parietal pleura that lines the wall of the thorax. The small space between the visceral and parietal pleurae is the pleural cavity. It contains a thin film of serous fluid that is produced by the pleura. 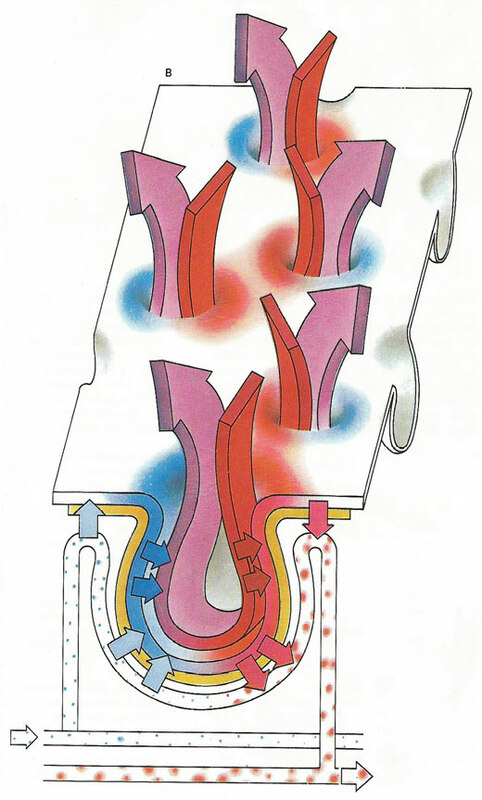 The fluid acts as a lubricant to reduce friction as the two layers slide against each other, and it helps to hold the two layers together as the lungs inflate and deflate. The lungs are soft and spongy because they are mostly air spaces surrounded by the alveolar cells and elastic connective tissue. They are separated from each other by the mediastinum, which contains the heart. 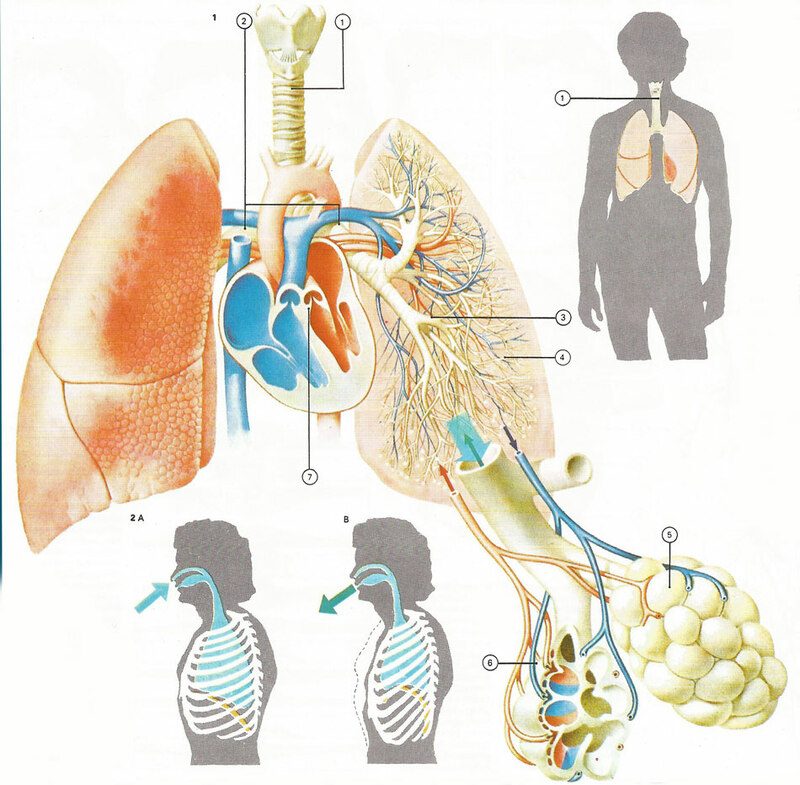 The only point of attachment for each lung is at the hilum, or root, on the medial side. This is where the bronchi, blood vessels, lymphatics, and nerves enter the lungs. When we breathe in, the thorax is enlarged due to a tightening of the muscles of the diaphragm (causing it to contract from a dome- to a saucer-shape) and of the rib-cage, which swings upwards and outwards. As the chest expands, the lungs must also expand, and the air inside them becomes rarefied, forming a low-pressure area. Air comes rushing down the trachea to restore pressure. Tension in the diaphragm and rib-cage muscles slackens and the lungs revert to their resting shape, pulling the thorax back to shape with them and, as they recoil the air inside them is compressed and some of it is forced out through the trachea. Quiet breathing – at intervals of from four to six seconds – involves intake of about 0.5 liter (0.75 pint) of air. Perhaps a third of this lingers in the bronchi and bronchioles, while the remaining two-thirds finds its way to the alveoli. Similarly, we breathe out roughly 0.5 liter at a single expiration. But, with a residual volume of 1–1.5 liters (1.75–2.5 pints), the lungs are never completely drained of air. Once air reaches the alveoli, oxygen is diffused into the bloodstream and carbon dioxide passes out from the blood to be expelled from the body. In addition to its main purpose – trading fuel for waste products – this exchange maintains the correct level of acidity in the blood. It is this acidity level that determines the rate of breathing. If breathing is too slow, a build-up of carbon dioxide causes slight acidification in the blood. This change in acidity level is monitored by special cells in the medulla of the brain and elsewhere, and these in turn signal deeper and faster breathing. In this way the acidity level is returned to normal.